Thanks to a couple of bearded brothers, some melted Valrhona, and a scandal the size of an invisible elephant, the entire country is paying attention to craft chocolate right now. That’s exciting! But it has also led many people to taste bean-to-bar chocolate against industrial chocolate like Hershey’s (for example, in this story from the Guardian and this one from Huffington Post) and conclude that it's crazy to pay so much for a bar of chocolate. That’s why I’d like to take a few minutes away from profiles of makers to talk about why a bar of craft chocolate is worth $10 — or more. Let’s follow two bars from the forest of cacao trees all the way to your mouth: One is a craft chocolate bar from a small maker like Amano, Fruition, or Dandelion; the other a candy bar from Hershey’s, Nestle, Mars, Cadbury, or any of the big players. Under the sweltering African sun, farmers are working as fast as they can, hacking football-shaped pods off trees and hurling them into big vats. Cacao is usually considered a cash crop, no different from cotton or rubber, and as such, companies like Mars want cacao that grows consistently and sturdily, no muss no fuss. That’s why in cacao-growing countries from Nigeria to Ecuador, these companies as well as local governments push farmers to grow high-yield but low-quality varieties like CCN 51, a man-made concoction that can produce as much as four times the world average but tastes, in food technologist Darin Sukha’s words, “dirty and undesirable.” Mars and Cadbury have both admitted to using CCN 51. Back at the farm, if workers are lucky, they’ll find someone to buy the beans at a very low price — think about 80 cents per pound. If they’re not, they’ll simply go hungry. These subsistence farmers are surviving hand to mouth, often malnourished and barely eking out a living. For example, Livingston Mwakipesile grew up sharing a bed with his brother in their tiny hut in Tanzania, and because he had to help his parents on the plantation, he didn’t start school until he was 14—and then only attended for three years. Over half of the population there lived below the poverty line, and most people ate only a handful of greens and cornmeal porridge once a day. “We didn’t have a good life,” he told me recently. In short, farmers aren’t paid fairly, and the quality of the beans is low. Deep in the Amazon, farmers are harvesting cacao beans. Then they carefully ferment and dry the beans in a way that highlights the best flavors and gets rid of any off tastes. Sometimes, after they’ve bagged the beans, they send them to makers in the United States. Craft makers pay much, much more than the fair-trade price for these beans. They develop lasting personal relationships with farmers and together decide on a fair price, anywhere between $2 and $5 per pound. Amano Chocolate, for example, pays $5.50 per pound for the prized Chuao beans in Venezuela. “Direct trade is all about personal relationships between myself and a farmer where we commit to helping each other,” said Geoff Watts of Intelligentsia Coffee, which was one of the first to use this method of trade. They know that by helping the entire community thrive, they’re helping themselves too. But in short, the beans are better. The bars are then wrapped by the thousands by machines and sent all over the country: to grocery stores, convenience stores, and anywhere else people go to get a quick fix of addictive, delicious sugar for a cheap buck. They’ve already sorted the beans, picked out stones, twigs, and the occasional machete. After the beans are finished roasting, they’ll crack them open, sort out the nib from the husk, and then grind the nibs with a tiny bit of sugar to produce smooth, silky liquid chocolate with a high cacao percentage (usually around 70 to 80 percent). Sometimes they’ll add other ingredients like cocoa butter, but many prefer two-ingredient “pure” chocolate. And they use the finest sugar. Patric Chocolate, for example, uses Wholesome Sweeteners organic cane sugar, brown sugar, and maple sugar in its chocolate, and Dandelion Chocolate uses sustainable sugar from the Green Cane Project. Then, some go the extra mile and mix and polish the chocolate even more (in the industry it’s called “conching”) to make the flavors sing even stronger. Each maker has perfected their own process, which takes years, and many have even built their own machines from scratch. They spend hours, days, years scratching their heads, sniffing chocolate, tasting a square, and then making tiny alterations in their process to make the chocolate even better—and sometimes they even throw out a whole batch if they’re not totally satisfied. 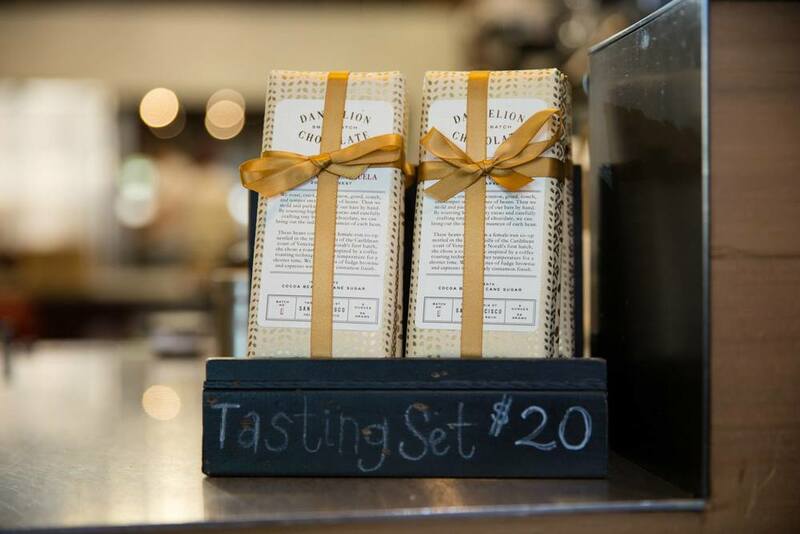 Finally the bars are wrapped, often by hand, in carefully chosen paper and sent to specialty stores, where the employees are more like sommeliers than salespeople, since this is so much more than candy. They cost anywhere between $7 and $20, but the maker has long since sunk more time and energy into them than that.